A massive earthquake hit Chile this morning. Tsunami warnings are out, and there are reports of a 131-foot wave the Juan Fernandez Islands. Continuing updates as available. NBC reportes a tsunami wave is expected to reach Hawaii’s coastline at 11:19 AM local time and 4:19 PM EST. Continuing updates as available. See updates below. If you are concerned about loved ones in Chile, call the U.S. State Department at 1-888-407-4747. See video below. See the latest update here. Two million people in Chile have been affected. The quake hit at 3:30 AM local time, and less than 100 miles north of the city of Concepcion, the second largest city in Chili. Power and phone lines are out-of-service. In Santiago, hospitals have been evacuated and the airport is closed. 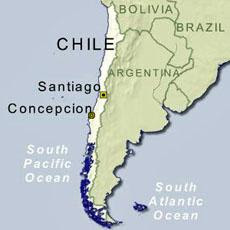 Santiago is located 200 miles from Concepcion. people live along the Bio Bio river. It is reported that the Nuestra Senora de la Providencia church was heavily damaged and the bell tower collapsed. Aires, Argentina, which is located more than 800 miles away. Tsunami warnings were issued for Hawaii, South America, Australia and New Zealand, Japan, the Philippines, Russia and many other Pacific islands. 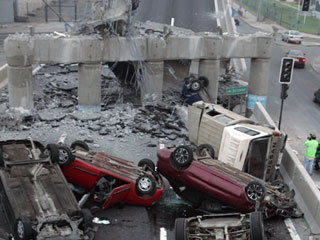 Chile is the home to the world’s biggest earthquake, measuring 9.5 magnitude, in 1960. At least 1,655 people died and 2 million were left homeless. Today’s earthquake is 64 times stronger than the one that Haiti in January 2010. It is deeper than the Haiti quake and due to the depth, it is hoped there will be fewer casualties. Continuing updates as available for the Chile 8.8. earthquake. As of 10:20 AM EST, no American deaths have been reported. 6.9 reported the largest as of 11:20 AM EST. USGS reported 11 aftershocks, of which five measured 6.0 or above. A USGS spokesman speaking on FOXNews at 10:40 AM EST just said a tsunami wave is expected to hit the coastline somewhere in Hawaii at 4:19 PM EST. 11:00 AM Ecuador time: 11:0 AM EST – Ecuador’s president, Rafael Correa said a tsunami has passed the Galapagos Islands, causing a swell but no damage. A “huge” wave hit the Robinson Crusoe Islands 410 miles off the Chilean coast. There are no reports of injuries or major damage at this time. of Chile, where it was reported to have caused “serious damage”. the other side of the Pacific,” he added. Tsunami warnings were issued for Guam, American Samoa and other Pacific islands. All Hawaiian coastlines are under Tsunami warning, including Waikiki. Update 2-27-10 12:20 EST: Four people died in a tsunami on Juan Fernandez islands. In the City of Concepcion, a city of 670,000, a 15-story apartment building collapsed, along with many of the adobe houses. There is darkness tonight, light coming from bonfires.